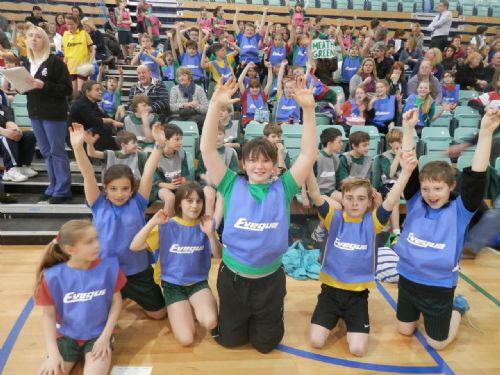 On Tuesday 12th March, we travelled to the Spectrum in Guildford for the P&G Surrey Games Primary Finals. About 2 week ago, we have taken part in the semi-finals and we secured a place in the finals by coming first. The teachers arranged a coach to take us there. The event started at 10.00am, so we had to leave school at 8.45am. Unfortunately, we were late because our coach was stuck in traffic on the icy roads around Horley, so we didn’t get in Guildford in time. Therefore, we missed the first race. This was the obstacle relay. The first event I took part in was the chest push. I think I did alright in this, but some of the competitors of the other schools were brilliant! Then Meath Green took part in the over/under relay. We scored points depending on how quickly we managed to complete the race. I had a long wait till my next event which was the javelin. We had a practice throw, the three real goes. Straight after that, I took part in the 4 by 1 relay which was the last race. I’m not actually sure where we came in the race. In the 4 by 1 I ran with James, Luke and Jamie. We didn’t have to wait long for the results and we found out that we came second to last which was 11th place. We were given certificates because of our sporting achievements and some yummy cookies which we ate while we walked back to the coach. Unfortunately the coach was parked far away but it was worthwhile because we got a glimpse of the athletic stadium which has a race track, javelin, football pitch and shot put. The journey back wasn’t as long as the way there, we arrived back at school around 2.30pm and we had the rest of our lunch in the hall – I was STARVING!! It was an amazing day and a cool experience which I will never forget. I am disappointed that we never won, but I am proud That I belong to MGJS WHICH HAS THE 11th BEST YR5/6 ATHLETICS TEAM IN SURREY. On Tuesday 12 March a very excited group of year 5 and 6 children travelled to The Spectrum in Guilford for the Surrey schools athletics finals. The freak snowfall meant that the coach was late and we nearly didn't make it to the competition, but even the weather couldn't dampen the children’s enthusiasm. We had the unfortunate disadvantage of arriving half an hour late and missed the first 2 events, but the children were raring to go never the less. Every one of them put in a sterling effort and it was all done with incredible team spirit and good sportsmanship. There was a range of different events from relay races to javelin and they did really well across the board. They were also very proud of Mrs. Whitmore for a very good performance in the teacher’s javelin event. Competition was difficult though as these were the best of all the Surrey schools. The children can be proud to say that they came 11th in the whole of Surrey and it was an achievement in itself just to be at the final. Well done to everyone who took part, you have done your school proud!